The interval between any two points that measures the completion of a single wave movement. The actual linear measurement, in metres, of one wave. The strength or width of one wave—the greater the distance from the transmitting site, the smaller this distance. The number of cycles per second, expressed in three units—Kilohertz (KHz), which measures the number of cycles per second, Megahertz (MHz), which measures millions of cycles per second, and Gigahertz (GHz), which measure billions of cycles per second. Radiated energy, which in free space travels in straight lines, and at the speed of light (186,000 miles per second). Radio waves have the same properties as light and heat waves, but are in lower frequency. The change in direction of travel of a radio wave that occurs when contact is made with the surface separating two different media. Where reflection occurs, the angle of incidence equals the angle of reflection. The bending of a radio wave as it passes from one medium to another or within a single medium with varied density. The bending of a radio wave when it grazes the edge of a solid, impassable object. The loss of radio wave energy as it travels through a medium. Attenuation is caused by the solid objects located on the earth’s surface, as well as molecules in the air such as water and dust. Layers of ionized gas caused by solar radiation, located between 60 and 200 miles above the earth’s surface, and varies daily and with seasons and latitude. Radio transmission energy that travelling roughly follow (run parallel to) the earth’s surface and is subject to surface attenuation—the lower the frequency, the less the attenuation. Radio transmission energy that is reflected or refracted by the ionosphere. Sky waves will continue to reflect or refract between the earth’s surface and the ionosphere until complete attenuation occurs. Radio transmission energy that continues through the ionosphere (without reflection or refraction) into space. Space waves neither follow the curvature of the earth, nor bend around obstructions. The distance between the transmitter and the point at which the first sky wave returns to earth—this is dependent on variations in the height and density of the ionosphere, with significant changes in skip distance occurring at dawn and dusk. Primarily by ground wave transmission, although sky waves are used for longer distances. Propagation is by line-of-sight (space waves), subject to modification by earth objects. Transmission path is predictable, ground waves are rapidly attenuated, and sky waves rarely exist. VORs transmit between 108 to 117.95 MHz. On the ground, the transmitter looks like a Gemini space capsule. Two signals are transmitted from the ground station (above), the first is the non-directional reference phase, and the second is the rotating variable phase. Both signals are transmitted 30 times per second. The variable phase transmits cyclically around the 360 degrees of the azimuth approximately 30 times per second. The reference phase signal is transmitted every time the variable phase transmission sweeps past magnetic north. Radial information is derived from the difference in time between the two signals (which would be different for each radial); this computation is referred to as phase difference, and is displayed by the airborne equipment. The VOR receiver in the cockpit incorporates three functions: (1) the Omni Bearing Selector (OBS) which appears as a rotating azimuth dial which provides for bearing selection; (2) the Course Deviation Indicator (CDI), which is a vertical needle that moves laterally along a row of dots, each dot representing two degrees; the CDI can be centred by rotating the OBS; when this is done the aircraft position on one of the VOR radials is indicated; (3) the TO/FROM Indicator informs whether the aircraft bearing is “to” or “from” the VOR. Before using a VOR, the instrument must be tuned and identified; to confirm the identity of the VOR, the “indent” function is turned on (much like a VHF radio) and the VOR identifier (three letters) is transmitted in Morse Code, which the pilot can read from his chart. VOR receivers sometimes have internal testing capability; but major airports provide VOT equipment (VOR Testing), in which the VOT frequency is selected and the equipment tested. The concept of a radial can be somewhat confusing. What has to be remembered is that there are 360 radials radiating from the VOR. If you are in reception range, and you have selected the proper frequency, the turning of the OBS will eventually centre the CDI (needle) with a FROM indication (arrow pointing downward)—when this is done the radial that the aircraft is on as indicated at the top of the azimuth. In the left display, the rotation of the OBS to 090° (at the top) has produced a centred CDI with a TO indication—essentially, the VOR is saying (if it could speak) fly 090° to proceed to the VOR. The aircraft must be to the west of the station. In the right display, with the aircraft in the exact same geographic position, the selection of 270° (using the OBS) has produced a centred CDI with a FROM indication—the VOR, in this case, is saying: fly 270° to proceed direct from the VOR. The radial the aircraft is currently on is only directly read from the right display, because it has a FROM indication. The present radial can also be discerned from the left display, but it has to be read at the bottom of the azimuth. As you can see, the VOR information has nothing to do with the heading of the aircraft. It doesn’t know which way you have the thing pointed. To make sure you don’t get confused, it is always a good case to orient the aircraft in the same course as has been selected on the OBS. When this is done, all the directions make sense. Another way to learn how to interpret information on the VOR display is to look at the four quadrants of a VOR. In the above example, the pilot has selected the 030° Radial—this appears at the top of the display. Note the various indications based on the quadrant in which the aircraft is located. To make comprehension easier, the aircraft depicted have been oriented to match the OBS selection of 030°. In the upper left quadrant, the CDI is deflecting right, indicating to the pilot that the aircraft is to the left of course. To intercept the selected 030° Radial, the aircraft must be flown in the direction of the needle, but this only works if the aircraft is oriented to the OBS selection. Note the FROM indication, showing that the aircraft is to the north east of the 90° off-setting radials—a line combining the 300° and 120° Radials. In the upper right quadrant, everything is the same as the upper-left except the needle is deflecting left. Here (upper right quadrant) the pilot must fly left to intercept the selected 030° Radial. Note that in the lower two quadrants the TO indication is displayed. Relative to the OBS setting, this tells that the VOR transmitter is in front of the aircraft. The reverse is the same for the upper quadrants, except the pilot is advised the VOR lies behind the oriented aircraft. Full deflection of the CDI from the “on course” or central dot marker indicates the aircraft is positioned 10° or more from the selected radial. VOR receivers sometimes have internal testing capability;2 but major airports provide VOT equipment (VOR Testing), in which the VOT frequency is selected and the equipment tested. Using a VOT, the CDI must provide an “on course” and “TO” indication when the 180° Radial is selected, and “on course” and “FROM” indication when the 360° Radial is selected (when the 090° and 270° Radials are selected the “OFF” or “Nav-flag” indication will appear. When checking the VOR over a known VOR checkpoint on the ground, the 4° tolerance is also applied. Similarly, any variation greater than 4° degrees when two VOR receivers are tuned to the same signal is an unacceptable difference and one of the aircraft’s receivers must be regarded as unserviceable. In contrast, an accepted tolerance of + /- 6° is applied to any airborne VOR check when the aircraft is positioned over a known landmark in association with a published radial. A variation from VOR transmitters is VORTAC, which combines VOR functioning with DME (Distance Measuring Equipment). A military variation is TACAN (Tactical Air Navigation) which requires Ultra High Frequency equipment (UHF) and is not commonly used by General Aviation. VORs are limited in that they transmit “line of sight;” thus the lower you fly, the closer you must be to pick up a signal; as a rule, 1.23 times the square root of your altitude above the transmitter gives you the current range of a VOR in nautical miles (NM). The advantage of VOR rests with its reliance on VHF energy. VOR signals are not subject to the errors and inaccuracies of LF transmissions—especially needle oscillations during electrical storms. Rather than a traditional VOR display, the position of an aircraft relative to a VOR transmitter can also be displayed by way of a Radio Magnetic Indicator (RMI) display. With an RMI, a bearing indicator continually points to the VOR station. The bearing indicator, in turn, is superimposed on an azimuth display that is virtually identical to the aircraft’s heading indicator. The azimuth, driven by a remotely mounted slaved compass, continually adjusts itself to reflect the aircraft’s heading—rotating just as the heading indicator rotates. In the example to the right, the aircraft is flying a heading of 086°, the bearing to the VOR is 055°, and the aircraft is currently crossing the 235° Radial. As discussed below, an RMI display can also be used to display ADF navigation information. ADF operates on low frequencies—200 KHz to 1750 KHz—which means commercial AM station broadcasts can be used, as well as navigation facilities. The transmission source most commonly used during IFR flight is the Non-directional Beacon (NDB). ADF provides a homing function—that is, the needle in the ADF cockpit receiver points to the station (Bearing Indicator). Again, the receiver must be tuned and identified before use. The advantage of ADF is that it is not limited to “line of sight” and is therefore effective for low-level navigation. The reason is that low frequency transmitters produce both ground and sky waves (signal bounces off the ionosphere). The ADF, however, is subject to numerous inaccuracies: (1) Quadrantal Error, whereby the signal is bent by aircraft metal; quadrantal effect is minimal at the cardinal points (nose, tail and wing tips), and greater in the intermediate bearings; (2) Needle Oscillation, whereby the needle oscillates in conditions of static (rainfall and thunderstorms) and weak transmissions; (3) Night Effect the needle relies on the ionosphere reflection at night and becomes more inaccurate; (4) Terrain Effect, whereby the direction of radio waves is altered when passing between water and land, especially if the waves intercept the shore line at 30° or more; (5) Mountain Effect, whereby signals are altered as they reflect off mountains; and (6) Ore Deposits, which cause deflections. ADF information is conventionally displayed by one of three means, the first of which is referred to as a fixed card bearing indicator, the second is referred to as an adjustable bearing indicator, and the third is referred to as a Radio Magnetic Indicator (RMI). In the case of the fixed-card bearing indicator, the ADF needle displays the relative bearing of the transmitter station—i.e., the bearing of the transmitter station relative to the longitudinal axis of the aircraft (relative bearing is discussed beginning P. 297). The ADF display card remains fixed with the 360° bearing set at the top of the azimuth display. When ADF is displayed with an adjustable bearing indicator, the pilot can manually rotate the azimuth display so the aircraft’s current heading is displayed at the top of the azimuth. When this is done, the bearing indictor shows the magnetic bearing to the NDB—i.e., the heading that must be flown to proceed directly to the NDB. 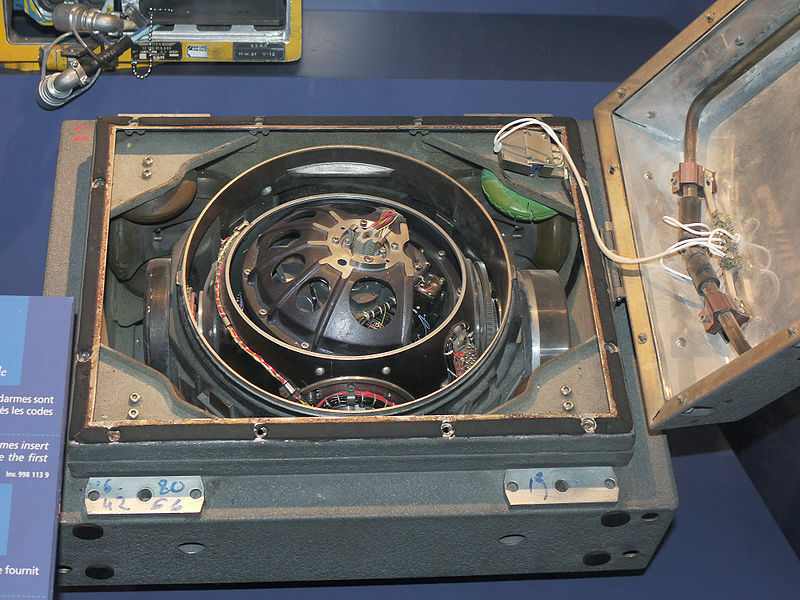 In the case of an ADF equipped with an RMI, the azimuth is turned automatically by a remotely mounted slaved compass so that the heading of the aircraft is continually displayed at the top of the azimuth. Like a correctly set adjustable bearing indicator, the needle on the RMI always indicates the magnetic bearing to the NDB. The Instrument Landing System (ILS) is the primary precision approach system used internationally, providing both horizontal (Localizer) and vertical (glidepath) guidance to a runway touchdown zone. ILS must have a final approach fix (FAF) which provides position confirmation; the FAF is either an NDB or a DME fix.4 The FAF is typically 4 NM from the runway,5 but may vary between 3.5 and 6 NM. The Localizer is unidirectional in that only the approach end of the runway—referred to as the front course—has conventional CDI display and interpretation—e.g., left CDI deflection means “fly left” for on course. If you were to make an approach on to the opposite runway, and centreline signal is still transmitted via the Localizer, but the CDI is not “reverse read;” accordingly, a pilot making an approach on this opposite or reciprocal runway with a left CDI indication would have to “fly right” for the “on course.” This reverse-read side of the runway is referred to as the back course. If an aircraft is equipped with an HSI or Horizontal Situation Indicator (see below), which is essentially a CDI display superimposed on the Heading Indicator, the CDI display will not reverse read on the back course (as the pilot essentially sees the CDI upside-down). The “TO/FROM” indicator during the tracking of Localizer always indicates “TO” irrespective of the aircraft position relative to the transmitter, its only meaning being that the signal is reliable. The transmitter of a Localizer signal is located on the centre line at the far end of runway for which it serves (i.e., off the departure end). The glidepath transmitter is located approximately 1000’ back from the approach end of the runway it is serving. There is no back course glidepath signal transmitted. It projects an electronic glide slope to coincide with the Localizer—the glide slope usually being a 3° angle. The glidepath beam width is approximately 1.4°; therefore a full deflection of the glidepath needle (positioned as a “cross-hair” to the Localizer) from the “on glidepath” or centre-dot marker is only .7°—amazingly sensitive! Caution with respect to glidepath indication as false signals are transmitted in multiples of the glidepath angle. The first glidepath is approximately 6° above the horizontal.7 False signals are reciprocal (up and down indications are reversed. A Localizer has specified areas of reliability. Outside this area, indications must be regarded as inaccurate. Approximately 18 NM from the transmitter, the Localizer is reliable 10° either side of the on-track indication, while 10 NM from the transmitter, reliability increases to 35° either side of the on-track indication (below, right). The Localizer is a VHF signal while the glidepath is a UHF signal that is “paired” with the VHF frequency. While the glideslope transmitter is located 400’ to 600’ off the runway centreline, between 750’ and 1250’ back from the threshold. ILS frequencies are identified by a two-letter code with an “I” prefix. Thus, the Localizer for Abbotsford is “IXX.” When a Localizer frequency is published with an “X” prefix, the Localizer alignment exceeds 3° relative to the runway centreline, and a precautionary note is published on the approach plate. DME stands for Distance Measuring Equipment which provides the pilot with the slant-range distance from a DME ground station. The functioning of DME is distinct from VORs in that airborne equipment transmits a signal to the ground station, this transmission being composed of paired pulses; when the ground station receives this airborne signal, it in turn transmits reply paired pulses back to the airborne receiver on a difference frequency, but with the same pulse spacing. It is the time difference between this exchange of signals that is translated by the airborne equipment into distance in nautical miles. DME signals are UHF and are therefore subject to line-of-sight limitations. DME frequencies are paired with VOR frequencies; therefore, by selecting the VOR VHF signal, the appropriate UHF frequency is automatically selected on the DME equipment—but you must pay close attention to depiction on navigation charts. DME is also paired with military TACAN signals—accordingly, while VOR equipment in civil aircraft cannot utilize TACAN signals (as TACAN signals are UHF), civil DME equipment can dial in TACAN frequency and obtain distance information. Note that VORTAC stations (combining military UHF and civil VHF) provide DME data. Since the translated distance is slant range, and DME equipment in an aircraft at FL370 directly over a DME ground station (based at sea level) would indicate a distance to the pilot of not less than 6.08 NM.10 Accordingly, the higher and closer an aircraft to the DME ground station, the greater the slant range error. The acceptable tolerance of DME indications in the cockpit is +/- .5 NM or 3% of the distance, whichever is greatest. Area Navigation radio navigation systems permit expanded station-referenced and often self-contained electronic navigation over any desired flight path that is generally independent of conventional airways structure. Area Navigation therefore revolves around track navigation between pilot-selected waypoints. In many instances Area Navigation track information is conveyed to the pilot on an HSI display (left CDI deflection means steer left for the on course, etc.) and distance information similar to DME (distance to waypoint). INS refers to Inertial Navigation System, a self-contained system that is independent of any external navigation aids. The initial position of the aircraft is entered into the computer (usually the precise longitude and latitude of the aircraft on the airport ramp), and a system of two gyro-stabilized accelerometers measure acceleration of the aircraft relative to a north-south and east-west electronic grid. Some INS systems incorporate ground station data input as a means of further enhancing accuracy. The latest generation of INS systems—referred to as IRS for Inertial Reference System—uses laser sensors rather than gyros, and the data is directly inputted into an aircraft flight management system. The term “RNAV” is currently used in two meanings, the first referring to all Area Navigation System—INS, IRS, GPS (also referred to as GNSS, meaning “Global Navigation Satellite System”), LORAN C, etc.—and the second sense denotes an airborne system that utilizes conventional VORTAC and DME ground stations. In this section, RNAV denotes the latter conventional ground stations. The airborne component of RNAV is a computer that takes radial and distance information from VORTAC and DME stations and allows the pilot to electronically create “phantom” VORTAC positions referred to as waypoints. Accordingly, by selecting a position referencing radial and DME from the nearest VORTAC, the pilot can electronically create a waypoint for that position such that the information received on the HSI and DME is as if a VORTAC existed there. In the RNAV mode the CDI deflection of one dot indicates ½ NM off course, as opposed to the conventional 2° indication associated with a convention VOR or VORTAC indication. LORAN-C is a low frequency, long-range navigation system in which the airborne receiver receives signal pulses from a widely spaced chain of ground stations. There are several chains in North American, each consisting of a master transmitting station and four secondary transmitting stations. The receiver computes aircraft position by measuring the time differences between the master station and at least two secondary stations. The pilot selects the chain of stations nearest to the aircraft position. LORAN-C is far less accurate than GPS and it is not uncommon to have errors up to 8 NM. The receiver can lock onto erroneous sky wave or other signals without warning. The accuracy overall is dependent on the geometric angles between the aircraft and the ground transmitters—the greater this angle, the more accurate the data provided to the pilot. The signals can be affected by local low frequency transmitters and power lines. Also, precipitation static interferes with reception. The failure of one transmitter in the chain can render a large surrounding area without signal coverage. On the positive side the range of signal reception is very good—up to 900 NM. GNSS is a term used to encompass both the US GPS system and the Russian GLONASS system, both of which are satellite based systems. Discussion here will refer to the GPS system. GPS11 is perceived by ICAO as the navigation system of the 21st Century. Developed by the U.S. military, the system became operational for civil use in 1994, and now provides amazingly accurate navigation information to within only a few meters in space. The system is based on the measurement of distances between the airborne receiver and satellites, thereby establishing position information based on triangulation. Precise calculation of distances is made possible by atomic clocks carried on each satellite, and distance is derived from measuring the time required for a satellite signal to reach the airborne receiver. While only three satellites would be theoretically needed to determine a position based on triangulation, accuracy would be diminished by potential inaccuracies in the atomic clocks of any one of the three satellites. To compensate for possible time errors, four satellite signals are used and four satellites are considered the minimum number of satellites required for a reliably accurate position fix. Until quite recently, GPS provided civilian aviation with what was referred to as “downgraded” navigation data. GPS satellites continue to transmitted (and perhaps still transmit) two types of code used for position identification—a “P” code, for “precise” navigation, and a “C/A” code, meaning “coarse acquisition” code. P-code provides “Precise Positioning Service” (PPS) that is only accessible to military receivers and requires a valid decryption key, while C/A code provides “Standard Positioning Service (SPS), accessible to all civilian receivers. Up until only a few years ago, SPS was a degraded PSS signal for reasons of national security,—a process referred to as Selective Availability (SA). In the winter of 2000, however, the C/A code was upgraded (or perhaps temporarily removed) so that civilian operators now have access to data whose accuracy is estimated to be equivalent to P code. Presumably, the signal could be again downgraded in the event of a future security problem. A GPS receiver identifies each accessible satellite within line of sight, accesses two data streams form the satellite—the navigation message (referred to as ephemeris) which contains orbital information that allows the receiver to calculate the satellites’ position, and the distinct C/A code (or P code if the receiver is military), which is simply clock information. The receiver then plots its estimated position from all available satellites using processed time and distance data—a measurement process referred to as pseudo range. The are numerous accuracy-degrading effects associated with GPS (ionospheric effects, ephemeris errors, satellite clock errors, multipath distortion, trophospheric effects, and numerical errors), but civilian GPS fixes are typically accurate to within about 50’. There are numerous augmentation systems for GPS—systems that enhance the accuracy and reliability of GPS position determination. Perhaps the more prominent of these is the Wide Area Augmentation System (WAAS) has been developed by the U. S. FAA, and consists of a network of 29 ground stations (referred to as WRS—Wide-area Reference Stations---these are located the continental U.S., Hawaii, and Puerto Rico), and four geostationary satellites. GPS/WAAS receivers obtain position data from both the GPS satellite network, as well as ground stations (communicated via the WAAS stationary satellites) to civil position determination to within 1.0 meters laterally and 1.5 meters vertically. Navigation information is provided by way of waypoints. Waypoints can be airports, intersections published on aeronautical charts, and traditional ground-based navigation transmitter locations. All waypoints are stored in the GPS by way of a data card provided by the manufacturer. The data cards are periodically updated and usually a subscription must be purchased. All GPS systems have facility for “user defined” waypoints. Information regarding the aircraft’s position relative to a waypoint is commonly presented by way of a moving map displayed on the GPS display screen. Distance in nautical miles is simultaneously displayed, and the pilot can select additional data such as groundspeed and estimated time en route to the waypoint. Systems also display track information in the traditional OBI display similar to those used with VORs. The dots on either side of the display are no longer “degrees,” as is the case with VOR displays, but instead are distance. The distance between dots can be altered by the pilot, but it is common for one-dot deflection to equate to 1 NM. Typically, GPS operates in two modes, the first being LEG mode, and the second being OBS mode. In LEG mode, the GPS will automatically cycle through a series of waypoints that are stored as a sequence in an electronic flight plan. Information display—distance, time, and speed—is always provided for the “next” waypoint in the sequence. If three waypoints are stored, for example—A,B, and C—the data pertaining to waypoint C will be displayed immediately after B is passed. In OBS mode the GPS will not cycle between waypoints, but will instead lock onto one waypoint, giving position information much like that of a traditional VOR—including TO and FROM indications. VFR-only GPS receivers cannot detect erred data in satellite transmission. IFR-certified GPS receivers must continuously monitor the performance of the system to ensure accuracy—the idea being, of course, that IFR operation based on GPS must have accuracy in position determination to ensure clearance from terrain. The problem is that the GPS Space and Control Segments cannot instantly fix a satellite if it begins to send misleading data to receivers, and for this reason IFR GPS receivers cannot simply rely on the GPS satellites where this possibility of position error exists. To remedy this, the feature of RAIM—Receiver Autonomous Integrity Monitoring—is included in IFR GPS equipment. “Receiver autonomous” means that the GPS can detect errors on its own, and it does this by using distance measurements from as many satellites as possible as a means of checking the consistency of the position (called over-determined position solution). If there are not enough satellites within reception range of the airborne receiver to assure position integrity, the receiver notifies the pilot. Five measurements with good geometry concerning the satellite positions are needed to provide RAIM; since an IFR GPS utilizes as a source of measurement the aircraft’s altimeter, the minimum number of satellites is four. If the measurements are inconsistent, the pilot is notified and RAIM does not exist. RAIM availability is rarely a problem during the en route and terminal phases of IFR flight, but the allowable limits are much tighter when an IFR non-precision approach is being conducted—during this phase aircraft commonly descend without visual reference to within a few hundred feet of the ground. A “RAIM not available” signal is useless during these critical low-altitude phases of an IFR approach, so the IFR receivers have the capability to check RAIM availability at a future time—i.e., when the pilot is planning to conduct the approach. By knowing the future geometry of orbiting satellites, RAIM is predicted by the receiver for the pilot’s benefit. An IFR pilot cannot conduct an approach unless predicted RAIM is checked and verified prior to crossing the Final Approach Fix. It is required with IFR GPS systems that the waypoints that make up a GPS approach are not entered manually by the pilot. Instead, the equipment must be designed such that the waypoints are automatically loaded in the corrected sequence from a data card when a particular approach is selected by the pilot. The navigation requirements that govern GPS operations in Canada are established in periodically updated Aeronautical Information Circulars. These apply to IFR operations. Two types of radar systems are in use: Primary Surveillance Radar (PSR ) and Secondary Surveillance Radar (SSR ). Both provide range (distance) and azimuth (direction) information of a target relative to a station. PSR is non-enhanced radar that conveys information to the operator based only on radar reflections from contacts, and therefore is the only system that can detect weather precipitation. PSR does not rely on information transmitted from an aircraft, and therefore does not provide altitude data. In contrast, SSR relies on airborne transponder and measures data based on SSR interrogation and transponder replies. SSR cannot provide position information for aircraft that are not transponder equipped; nor can it provide information on weather. Its operation advantage is derived from increased range, positive identification and altitude information. SSR is the main source of radar data for en route (airways) facilities. Independent Secondary Surveillance Radar (ISSR ) is considered long-range radar, and is capable of providing coverage up to 250 NM. In contrast, Terminal Surveillance Radar (TSR ) combines both PSR (80 NM range) and SSR (250 NM range). It is characterized as a short range, high definition PSR system that provides highly accurate information related to altitude, azimuth and range—sufficient accuracy to be classified as a “precision approach” comparable to an ILS system. The formal name for this system of radar is the Airport Surface Detection Equipment (ASDE ). It is also a short range, high definition PSR system that provides surface traffic information when airport visibility is reduced—aircraft and vehicle movements on runways and taxiways. A recent crash of a commercial aircraft in Europe was attributed to cell phone use in the aircraft. Crew members should specifically advise passengers to turn off cell phones during flight. FM radio and television broadcast receivers produce radiation that can interfere with ILS and VOR receivers, while AM radio receivers and electronic calculators can interfere with ADF receivers. Should the ground transmitters associated with radio navigation aids be unserviceable, the identifying Morse Code signal is suspended; accordingly positive identification of a signal is crucial to safe navigation. All abnormalities with radio navigation performance must be reported to ATS. 1 HF frequencies are suited to locations where communication is required over long distances—long, over-water flights, and flights in northern Canada. HF is the only way to communicate over ranges of 2500 miles or more. The quality of HF communication is somewhat unpredictable owing to the unpredictable nature of the ionosphere. Higher range HF frequencies are more efficient during the day, and lower range HF frequencies are more efficient at night. 2 Internal testing capability in VOR equipment is now rare. 3 This was reported on the Transport Canada exam: What should be done if the VOR indicates a 4° error? Choices are: use without correction; make correction by adding 4°; use with correction by subtracting 4°; or do not use. 4 A FAF based on DME is used if it is not possible to position an NDB—the ILS approaches to Runways 26 at Vancouver. DME signals used for an ILS approach normally have a range of about 40 NM. 5 Instrument Procedures Manual (IPM), P. 4-44. 6 Full-left CDI to full-right CDI on a Localizer equates to 5°, while the same deflection on a VOR equates to 20°. 7 For this reason, the altimeter must be cross-checked when crossing the FAF. 8 These have been phased out in Canada, but many exist in the U.S.
9 For further reading on marker beacons, see IMP, P. 2.52. 10 Based on 6080’ per NM. 12 The GPS system is composed of three segments: the Space Segment, the Control Segment, and the User Segment. The Space Segment is composed of the 24 NAVSTAR satellites that orbit the earth. The satellite orbits are precisely planned so that the entire surface of the earth may use the GPS system 24 hours per day, every day. There are almost always more than six satellites in view from every location on Earth. The Control Segment consists of a network of ground-based monitoring and control stations, with the Master Control Station located in Colorado Springs. The satellite data is collected by other ground stations, but is assimilated and analyzed in Colorado Springs. The Master Control Station has facility for the “uplinks” required, for example, to make system clock corrections. The User Segment includes pilots with GPS. 13 PAR facilities are far more common in the U.S.